Jeah! This swimming stud stayed single during the 2012 Olympics but still managed to find the grill of his dreams. If you think dental work is expensive, check out the price tag on Ryan Lochte’s decorative dental grill: $25,000. It’s a good thing Lochte only sports his sparkly smile during special occasions. Prolonged use can trap food particles and bacteria around teeth and gums. Out of respect, the Olympic committee asked him not to wear it on the podium. Fortunately for Ryan, there were plenty of post-podium photo ops that let him flash that red, white, and blue bling. Watch for Ryan’s new one in 2016—it’s made of black diamonds. The pose is a podium tradition: Olympians biting their gold as if it were gelt. Though chocolate coins would be a worthy way to taste victory, what’s the appeal of a mouthful of metal? No one knows for sure, but historical counterfeiting may play a role in the metal mystery. Coins used to contain precious metals, so money handlers would bite them to test their authenticity. Another explanation may be photogs’ obsession with the pose. The snapshot has become a Summer Olympics staple, and iconic shots are easier to sell. Synchronized swimming is one of the more offbeat Olympic events. But this strenuous sport requires stamina, strength, and lots of smiling. If you think it’s hard to smile when you’re having a bad day, imagine holding your breath and exerting an enormous amount of energy—all while smiling! And those smiles pay off positively in the judges’ scores. Since 2004, a team of dental professionals volunteers to give athletes gratis care. Surprisingly, traumatic care isn’t the most requested service. 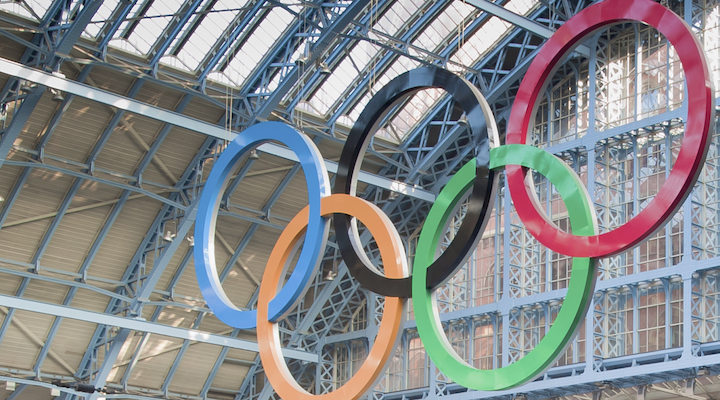 At the London Olympics, nearly half of participants hadn’t had a dental exam in the last year, according to the clinic. The clinic goes beyond cleanings too, providing mouthguards and on-site dentists during competition. The hope is that athletes return home as more than Olympians—but as oral health advocates. What’s your favorite Olympic [smile]stone? Share yours below!